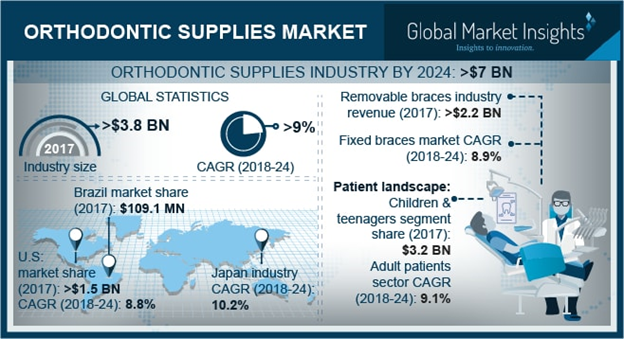 Orthodontic Supplies Market size is set to exceed USD 7 billion by 2024; according to a new research study published by Global Market Insights, Inc.
Increasing incidence of malocclusion in children and adults will drive industry growth during the forecast period. Currently around 60% to 75% of the total global population is suffering from malocclusion or misaligned teeth. Rise in need for orthodontic treatment for malocclusions and other different orthodontic disorders will garner opportunities for the industry growth. Technological advancements in removable braces such as improvements in design has enhanced outcomes fostering greater product adoption. The rise in awareness among the people about their physical appearance in Europe region has escalated the demand for use of technologically advanced invisible removable braces. However, unfavorable reimbursement policies and insurance coverage for orthodontic treatments in majority of the growing markets such as Asia Pacific and Latin America region will impede the orthodontic supplies market growth. Fixed braces held significant industry share with revenue of over USD 1.2 billion in 2017 owing to the increasing prevalence of malocclusion. The use of fixed braces for malocclusion treatment has become quite imminent and will therefore escalate the business growth in the near future. Adult business segment will witness over 9% CAGR over the forecast timeframe. There has been considerable increase in the number of adults undergoing orthodontic treatment such as malocclusions owing to increase in disposable income and rise in awareness regarding oral healthcare. U.S. market is expected to witness 8.8% growth due to increasing number of teenagers and adults opting for orthodontic treatment, growing adoption of invisible and removable braces, favorable reimbursement policies and extensive insurance coverage. Brazil market was valued at USD 109.1 million in 2017 owing to rising healthcare expenditure and growing awareness regarding oral healthcare. Presence of developing healthcare system providing necessary treatments for all aspects of orthodontic treatment will further augment demand.